(Photo: Mark Morris Dance Group in Violet Cavern. Mark Morris Dance Group performs two pieces, Festival Dance and Violet Cavern, from their repertoire at the Moore Theater December1-3. Morris, a Seattle native, is most strongly known for his clear devotion to and physical representation of the music, evinced by having received the prestigious Leonard Bernstein Lifetime Achievement Award for the Elevation of Music in Society. These two pieces, although different in musical tone and genre, were no exception to Morris’s musical devotion. (Mark Morris Dance Group in Violet Cavern. Violet Cavern, choreographed to the jazz influenced music of The Bad Plus, took a more modern turn from the traditional ballet vocabulary utilized in Festival Dance. The piece started in darkness, haunting the audience with dramatic piano chords in steady succession. 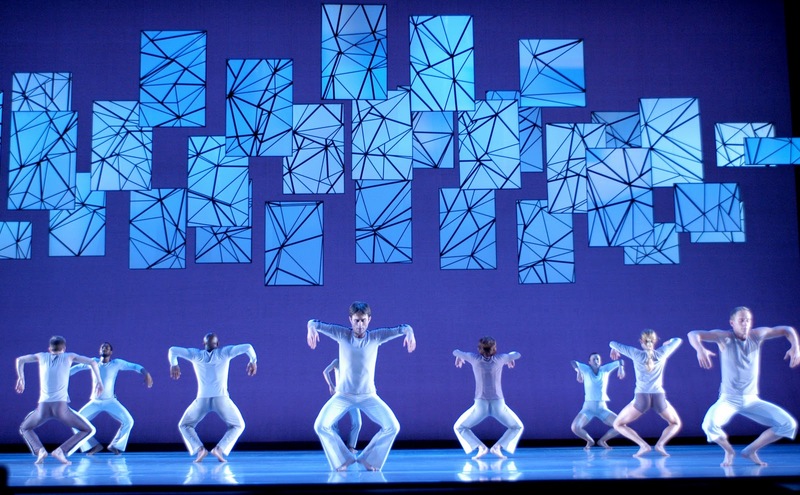 As the curtain lifted, the violet silhouettes of one dancer standing among figures lying on the floor, with patterns of intersecting lines hovering overhead immediately captivated the audience. The standing dancer slowly slipped into a beautiful grande plié establishing a sequence that would be manipulated, repeated, and evolved as the piece continued. Morris’ use of the music was more than merely the physical depiction. He commented on the music through the tone of the vocabulary and timing of the movement more so here than with Festival Dance. At one point, the volume grew to an intense level while the dancers continued their slow and controlled pace, unaltered by the shift in music. Morris’ use of modern vocabulary spoke to a more traditional Graham approach with intense contractions and drama espousing every phrase. While captivating images and more dynamic coupling interactions existed, the actual sequences repeated throughout the piece lacked the same level of appeal, and could have been seen a lot less. The technical prowess of the dancers and musicians carried both pieces. The dancers’ strength and clarity of execution coupled with their attention to the smallest of details kept the audience engaged and fully appreciative of their performance. A standing ovation to their talent and generosity of spirit was much deserved and earned. Don’t miss these lovely bodies and musicians December 2nd and 3rd at the Moore Theater. Tickets are available at http://stgpresents.org/artists/?artist=1692.